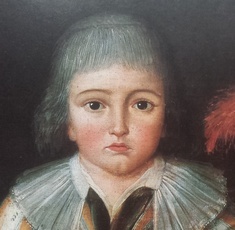 Galindo housed at the Museo Nacional del Virreinato in Tepotzotlán from 1783 which bears the signature Mariano Vasquez and some scholars have pointed out that it might be an early work by the artist. Vasquez was also an academic at his alma matter and successor of Ximeno, his professor as director of the institution. He was succeeded by the sculptor Pedro Patiño Ixtolinque. There are records of him receiving 300 pesos for 5 paintings and another similar payment for a St Dominic and a St Peter for the Recogidas chapel in Mexico City. His works can be admired at the Mexico City Cathedral (Last Supper 1811) the Soledad Chapel, he painted the portraits of several viceroys which are now at museums like the Museo Nacional de Historia. His most celebrated portrait is that of María Luisa Gonzaga Foncerrada y Labarrieta, from 1806, now at the Pinacoteca Virreinal de San Diego.